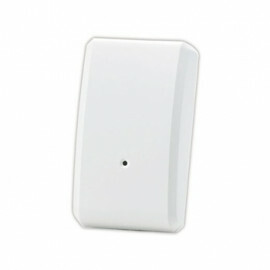 Z-Wave Plus Smart Implant Sensor - FGBS-222 from Fibaro. FIBARO Smart Implant allows to enhance the functionality of wired sensors and other devices by adding Z-Wave network communication. You can connect binary sensors, analog sensors, DS18B20 temperature sensors or DHT22 humidity and temperature sensor to report their readings to the Z-Wave controller. It can also control devices by opening/closing output contacts independently of the inputs. Whether to control your garage door or the heating system, as an intelligent supplement to your alarm system or simply to make every device smart in your home. The FIBARO Smart Implant can also be connected to sensors in the garden that the Smart Home does not end at the front door. As a further development of the Universal binary Sensor, the FIBARO Smart Implant controls the connected device, can be used for scene control, has a temperature sensor and is compatible with binary sensors. Attention! Smart Implant Sensor - FGBS-222 is not an battery operated device. It is always awake so it can route Z-Wave frames.